What is water conservation? Water conservation is the act of reducing water usage. Water conservation can be performed by people, organizations, companies or government agencies. This can be done by addressing the water shortage issue, by changing consumption or reducing water usage. Water conservation became a hot topic and was highly addressed in the late 20th century as the developing world began to consume large amounts of water while many people did not have access to safe, clean drinking water. 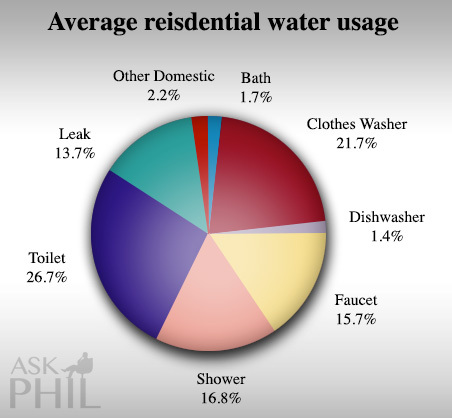 When water supplies are limited it becomes much more obvious why water conservation is necessary. Water conservation policies can change during a drought, or during summer months in desert areas where restrictions may be placed on water usage such a watering lawn or washing cars in driveways. Water conservation is important in dryer areas, such as desert areas, because the water is either shipped it in or delivered through aqueducts from distant areas, and the policies in those far away areas can dictate how much water is sent. Water prices is another important motivation for water conservation. The most prominent factors of water cost is how easy is it to deliver water to an area, how far it must be transported and how much treatment is needed to have the water safe for consumption. It is very expensive to treat water to be made safe for consumption and for agricultural uses. Water prices can be effected by not only how much water there is, but how much water treatment is required. Using less water in general helps keep water prices down and allows water to be used for other resources. Next to air, water is the most important element to sustain human life, which is why some people passionately promote water conservation. For the most part, water is a renewable resource. However, processing water to be made safe to be re-entered into the water supply and safe for drinking is a very costly and time-consuming process. It requires many steps to remove biological waste, chemicals or hazardous materials and make it safe once again. In communities that are very conscious of water conservation, using water for the lawn, to wash the car or for industrial use is highly disapproved of. Local government may issue an order to discontinue certain water uses, such as watering lawns and washing cars in driveways, and can issue steep fines for offenders. Water is one of the most valuable resources on earth, for humans it’s one of the three major requirements to sustain life, which is why water conservation is so important. Water conservation helps to ensure there will be clean water for future generations and for distribution to other regions of the world. If using an automated dishwasher, be sure to load the dishwasher to it’s fullest capacity before running it. Install water conservation filters in taps in around the home. Water lawns and gardens during the night hours to avoid evaporation. Turn water off during a shower while shampooing and using soap on the body then turn water back on to rinse off. Take only one shower a day when possible. Do not pour out excess drinking water from meals, collect the water to boil for tea or coffee or use it for watering plants. Implement more desert friendly yards and gardens in hot areas. For example, use rocks, paving and succulents that require little or no watering instead of grass or other plants that require large amounts of water. Fix leaky pipes and faucets, a drippy faucet and use as much as a gallon a day. Purchase products that promote and advertise water conservation and more water efficient.